Maritzburg United showed incredible fighting spirit to score three times in the last 10 minutes against Jomo Cosmos at Olen Park on Saturday. United were spurred on by a large contingent of their fans, who faithfully made the long trip up to the North West to witness a dramatic and ultimately succesful final game of the season. 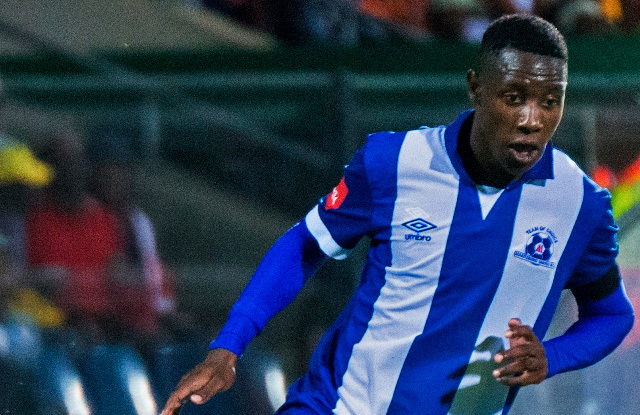 The victory lifted the Team of Choice out of the relegation zone and up into 14th spot - Absa Premiership football for next season secured in the final 10 minutes of the season. United started brightly, Thamsanqa Mkhize heading wide from Philani Zulu’s 11th minute cross before Thamsanqa Teyise’s header from a 16th minute corner kick was cleared off the Cosmos goal-line. Ezenkosi took the lead againgst the run of play, Limba Mntambo scoring from distance on 27 minutes. It was nearly 2-0 three minutes later when Tebogo Makobela went clean in on goal, but Team of Choice keeper Virgil Vries did superbly to make the block. Vries had to be on top of his game once more just after the restart, the Namibian again coming off his line to prevent a clean shot on goal, this time denying Mntambo. But as the second half progressed, it was Maritzburg who took control of proceedings, peppering the Ezenkosi box with regular balls into the box. But things would just not go their way as Cosmos goalkeeper Sherwyn Naicker did superbly to tip Zulu’s rasping drive over the bar, while defender Ndabhenle Mthembu made some excellent clearing headers. There was also an overhead kick from Maritzburg substitute Gregory Maasdorp which sailed over the bar, while the visitors were denied what looked a good shout for a hand-ball by referee Daniel Bennett. Finally the Team of Choice had their goal, in the 83rd minute, when substitute Mohau Mokate lobbed a header over Naicker following a goalmouth scramble. And they were ahead for the first time in the game, only three minutes later, when Abia Nale’s near-post cross picked our Evans Rusike, who expertly guided the ball into the far corner of the net. Rusike sealed the win three minutes into added time when he burst clear on the counter-attack before netting with a scorching angled drive.